Chances are if you like Rancid, that Madcap will find a place in your heart as well. This So Cal punk rock outfit's latest 11-track offering strikes quite a few chords with both the punk/ska community and the rock crowd, making UNDER SUSPICION the most well balanced of the band's works. 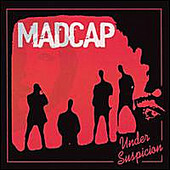 Citing not only the obvious Clash and The Jam influence, but also taking it back to such rock luminaries as Bruce Springsteen and Elvis Costello, Madcap incorporate the big rock sound of the '80s masterfully in such tunes as the reggae-flavored "Under Suspicion" and the rebellious jolt of "Youth Explosion". Yes, the band wears suits and ties and looks like an average skankin' rawk band, but underneath it all lie a lot of heart and solid slabs of melody which make Madcap the street punk band that you can hum along to.